Toronto FC lost a 3-2 decision to reigning Mexican league champions Tigres on Tuesday night in a wild second leg of its CONCACAF Champions League quarter-final. Despite the loss in Monterrey, the Reds still managed to advance to the semifinals – the final aggregate score was 4-4 over the two legs, but Toronto advanced on the away goals rule. Toronto earned a 2-1 win in the series opener last week at BMO Field. This marks the second time TFC has reached the Champions League semis, having previously qualified for the final four in 2012 under Dutch coach Aron Winter. This was not a vintage Toronto FC performance. Though the Reds started the match brightly and enjoyed a few flashes of brilliance in the final third of the pitch (mostly courtesy of Sebastian Giovinco), this came down to survival. After a composed opening 65 minutes, Toronto had to switch into survival mode against a tough opponent in an intimidating stadium, Tigres’ Estadio Universitario, nicknamed El Volcán (“The Volcano”) on account of the amount of noise its vociferous fans generate. Andre-Pierre Gignac’s late brace gave Tigres the lead, and you had the feeling that if the game lasted five more minutes the Mexicans would have scored the goal that would have given them the aggregate victory. Instead, the Reds valiantly held on and managed to just cross over the finish line as time ran out on Tigres. Critics will argue they were lucky to go through, and to be fair there was some good fortune involved. At the same time, credit must also be given to Toronto for winning the first leg, and for earning the result it needed in hostile territory to advance. Was it perfect from TFC on the night? No. But they did what they had to do, and in the end, that’s what matters. Giovinco should be singled out for his contributions on the day in setting up one goal and scoring another. Praise should also be showered on defender Chris Mavinga, though. The Frenchman was immense in making a series of key interventions and tackles for Toronto, bailing out fellow defenders Drew Moor and Eriq Zavaleta. Mavinga hobbled off the pitch and out of the game in the 62nd minute, and it’s no coincidence that all three of Tigres’ goals came after his premature exit. The Liga MX champions dominated possession and dictated the pace for most of Tuesday’s match against the MLS Cup winners, who had to sub out Mavinga and fellow defender Justin Morrow with injuries. Tigres positively surged in attack for the final 25 minutes, as TFC was forced onto the back foot and just held on for the result it needed to move on to the next round. After a fairly even half that barely featured any dangerous shots on goal, the second half erupted into life with a flood of goals. Toronto took the lead in the 64th minute via an own goal by midfielder Rafael Carioca as the visitors controlled the ball in Tigres’ penalty area. Giovinco’s attempted pass to Jozy Altidore hit a Tigres defender and then deflected off of Carioca before trickling over the goal-line past helpless goalkeeper Nahuel Guzmán. The hosts equalized five minutes later through Chilean international Eduardo Vargas, who nodded one home off a corner kick after being left unmarked near the top of the six-yard box. 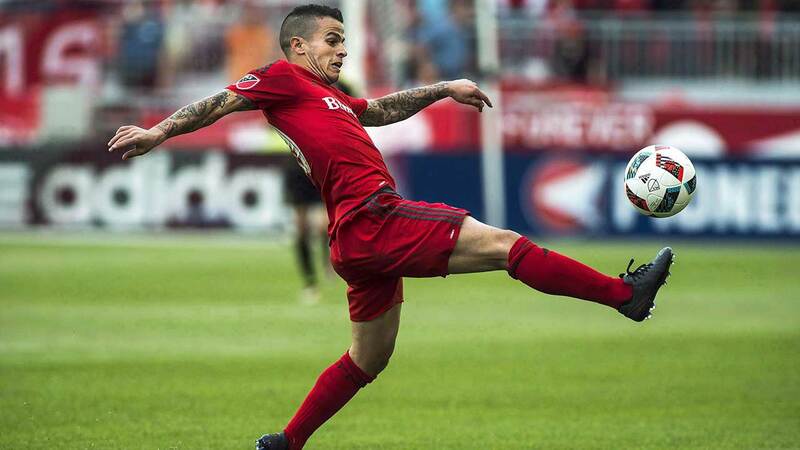 Giovinco restored TFC’s lead in the 73rd minute when he whipped in a free kick that tucked inside the near post. It was a well-placed shot by the Italian, but Guzmán should have palmed it out of danger. The Mexicans battled back and knotted the score a second time when Gignac poked the ball past goalkeeper Alex Bono in the 84th minute after a cross skipped past two TFC defenders inside the box. Gignac dragged his shot wide of the far post moments later after slipping in behind Toronto’s defence. The Frenchman converted from the penalty spot deep into injury time, but it wasn’t enough for Tigres. TFC will meet the winner of Club America (Mexico) versus Tauro FC (Panama) in the semifinals. Club America won the opening leg of its quarter-final, 4-0 at home. The second leg is Wednesday night. Earlier on Tuesday, the New York Red Bulls earned a 3-1 home win over Mexican side Club Tijuana to win their quarter-final 5-1 on aggregate.